The Ruben Galarreta mesh hoodie is a very innovative take on classic hoodies. 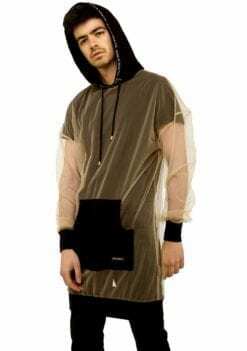 This refreshingly new mesh hoodie proves that hoodies are the new trend. Model size: Height: 178 cm/ 5.8 ft. The Ruben Galarreta mesh hoodie is a very innovative take on classic hoodies. This refreshingly new mesh hoodie proves that hoodies are the new trend. 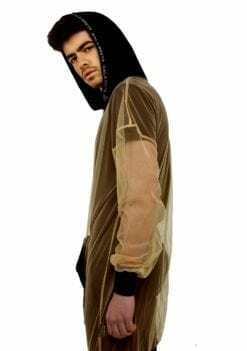 It is an out and out see-through style made of beige net fabric except for the hoodies, pockets, bottom hem and cuffs which are made of cotton. The cuffs and bottom hem are made with elastic rib so that they can be secured and held in place and also contributes aesthetically to the style. The style comes in a size set of three- Small, Medium and Large. Overall, the style is an oversized silhouette inspired heavily by the oversized, laidback street style trend. The hood has the signature Ruben Galarreta eponymous label printed and the pockets have a silicon brand label. The hoodie can be secured by laces which have metallic gold accents on the eyelets. Coming to the styling aspect, this style is a stylists’ dream. Ideally, a Ruben Galarreta fangirl would wear it as a single piece as she is body confident, risk-taking, attention lusting and most of all a perpetual jaw dropper! There are so many ways in which this hoodie can mix and match. If you want to bare it all, you can wear it as a single piece and set the temperatures soaring. You can also wear it with a half sleeve T-shirt beneath and pair it with joggers for a fun collegiate look. You can even pair it with a Ruben Galarreta bandeau for an edgier street friendly version. If you are looking for something that is more risque, then wear it as a dress with our Ruben Galarreta bra. Wear the hoodie and pair it with sneakers for an unconventional “I-do-not-play-by-the-rules” look. Black Bandeau and Skirt the model is wearing is not included.